This is a test of many cars. 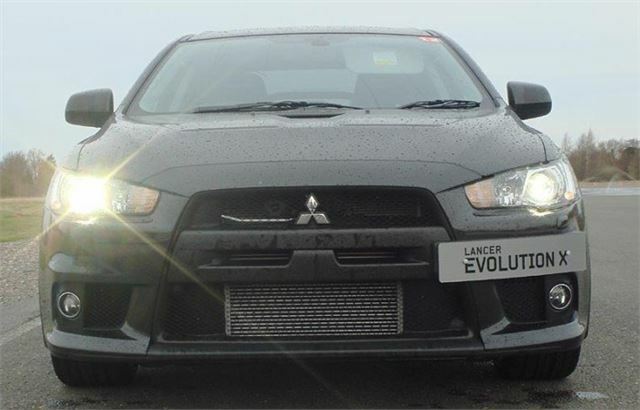 Not just a Mitsubishi Lancer EVO X, but a whole range of Mitsubishi Lancers from mild mannered front wheel drive 109PS diesels to 359PS fire breathing petrol fuelled four wheel drive monsters. Before, in the UK, we got Australian built Lancers that were sensibly priced Focus size cars. 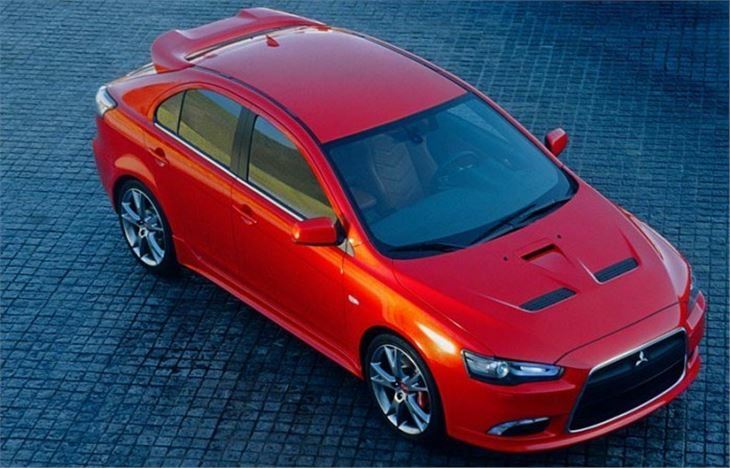 And a series of Japanese built hotshot EVOs, all based on entirely different, but ageing Lancer saloons. The EVOs had fairly explosive performance and culminated in something called the ‘FQ 400’ that was almost too quick for its own good. A 400bhp four-wheel drive 2.0-litre roadgoing saloon was taking ‘evolution’ about as far as it could go. But now the line between Lancers and EVOs is far less distinct. Like the old car, the new Lancer is a four-door saloon, but it’s a bit bigger and heavier and in the summer will be joined by a five-door ‘sportback’. The range will start with a 1.5 litre five-door ‘Sportback’ at £12,499. And immediately does start with a 1.8 litre four-door saloon, in three trim levels, and the option of a six selectable ratio CVT automatic. Biggest normal engine is a 2.0 litre 140PS pumpe duse diesel, bought in from VW and bolted to a 6-speed manual. Then things start to get interesting. Because topping the normal Lancer range will be a 240PS four-wheel drive Ralliart Sportback loaded with a lot of EVO features including Active Yaw Control and an Active Centre diff. It will also have an aluminium bonnet with snouts, Recaro seats and Mitsubishis new twin-shaft twin-clutch SST transmission, which is pretty much the same thing as VAG’s DSG and Ford/Getrag’s forthcoming ‘Powershift’. 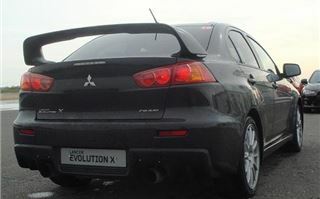 So there will be a ‘warm’ four wheel drive Lancer automatic to start nipping at the rear skirts of Audi quattros. Moving swiftly on to the EVO X, this comes with three power outputs: FQ300, FQ330 and FQ360. All have five-speed rather than six-speed manual gearboxes, and the FQ300 has the option of the same twin-cutch SST as the Ralliart. I got to drive the diesel, the 1.8 manual, the 1.8CVT, the FQ330 manual and the FQ300 SST. Let’s start with the FQ330. Not masses to report because it and the 1.8 manual were all on skidpans to check out the effectiveness of the traction control systems. On the EVOs you have three levels: all on, half on, or all off. To get it half on you press the button twice. To get it off completely you have to press the button and hold it for five seconds. 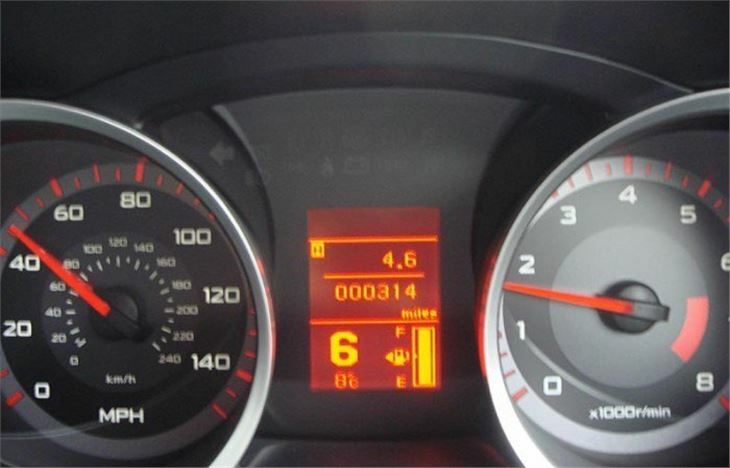 It reverts to ‘all on’ whenever you switch off the ignition and re-start. Basically ‘all on’ comes down like a big wet comfort blanket and as soon as the car starts to slide it cuts power and applies brakes to try to sort things out for you. ‘Half on’, you get a lot more latitude, so it’s enough to have some fun before stepping in and saving your life at the last second. ‘All off’, the car will slide as nature and physics originally intended. 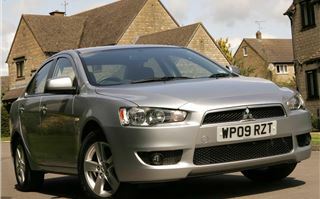 The front drive Lancer gets a simplified form of this. Either off or on, but with only front wheel drive it’s best left on. Next, because the EVOs had yet to be Type Approved and we couldn’t take them on the road, we got some track time in the FQ300 SST. As with the traction control, there are three settings, in this case ‘Normal’, ‘Sport’, and ‘Supersport’. You can shift to ‘Sport’ on the fly, but to prevent you picking ‘Supersport’ inadvertently, you have to stop and hold the switch for five seconds to select it. 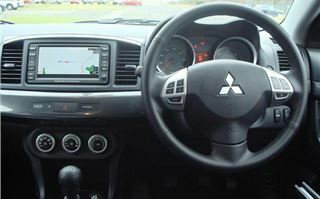 You also have steering wheel paddleshifts to select the six gears, or a forwards down, backward up conventional shifter. In quick and moderate corners it’s simply best not to fiddle. The box will make good decisions and leave to get on with the business of steering and throttle control. But in slow corners, in ‘Sport’, it bogs down. In ‘Supersport’ it doesn’t, and hangs on to all the gears for longer, so for track day fun that is the only setting to use. The last bit of track we got onto was one used for training rally drivers. A maze of adverse cambers, changing surfaces and very tight corners. All 2nd and 3rd gear, no more, and necessary to use the paddles. Except on this car, really pushing hard, it wouldn’t always let you have 2nd when you needed it. Not for me. And not for the rally driver who took us round a lot quicker. Probably the electronics protecting the clutches and cogs from hard downshifts. But this was a very extreme type of driving that you wouldn’t try on the road unless you were sure that nothing was coming and no one was looking. The main point of the SST is to offer an automatic EVO, the lack of which, in the past has kept customers out of Mitsubishi showrooms. Now they can come and buy their ideal dual-purpose car. A lazy, reasonably refined, well-equipped cruiser when they want it to be. And a hooligan when they don’t. Audi quattro Tiptronics and DSGs at last have a serious competitor. Enthusiasts can stop reading here. 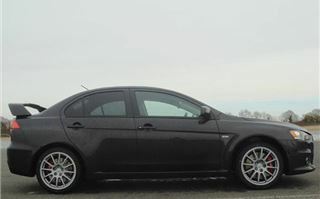 Because at the end of the day I took the Lancer diesel and the 1.8CVT on a 15 mile road route. The old VAG 2.0 litre TDI 140 is its usual clattery self at first. But they’ve altered the mapping slightly to give it a bit more low down torque and I’m pleased to say that this now available from around 1,500rpm in 6th, which is geared more like 33-34mph per 1,000rpm rather than the usual 35-36. It actually handles very well indeed for an ordinary front-drive diesel saloon, pitching itself up as a competitor to the likes of the Mazda 3 2.0 diesel Sport and the VW Jetta TDI 140, which has the same engine. The boot isn’t quite as cavernous as the Jetta’s though. The CVT whirrs like a foodmixer left to its own devices. But it can be manually controlled and curiously by a lever that, unlike the EVO SST’s, works back to front. However, you aren’t going to be developing the same physical forces on your body in the rather sedate CVT, so that doesn’t matter too much. 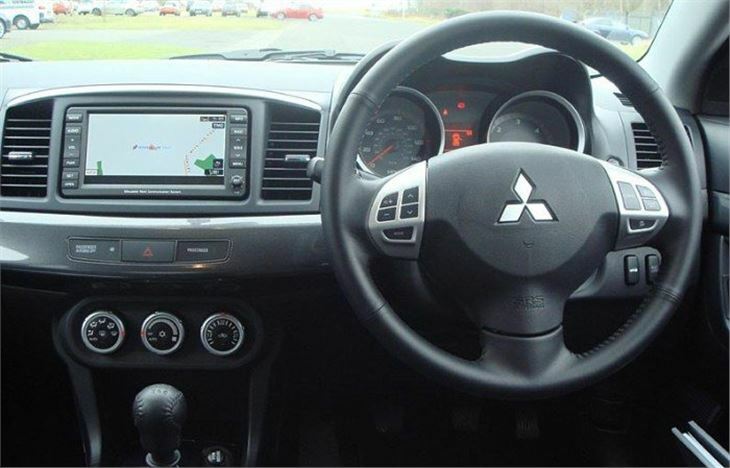 It is much better controlled manually and, like the diesel, is a decent handling standard saloon car with a very well tried and tested CVT transmission that has sold by the hundreds of thousands in the Far East. None of the cars have reach adjustable steering wheels, which seems a strange omission these days. The boot is a bit slot-like and nothing like as big as a Jetta’s. And as soon as you go to big wheels you get an inflator and a bottle of glop rather than a spare wheel. 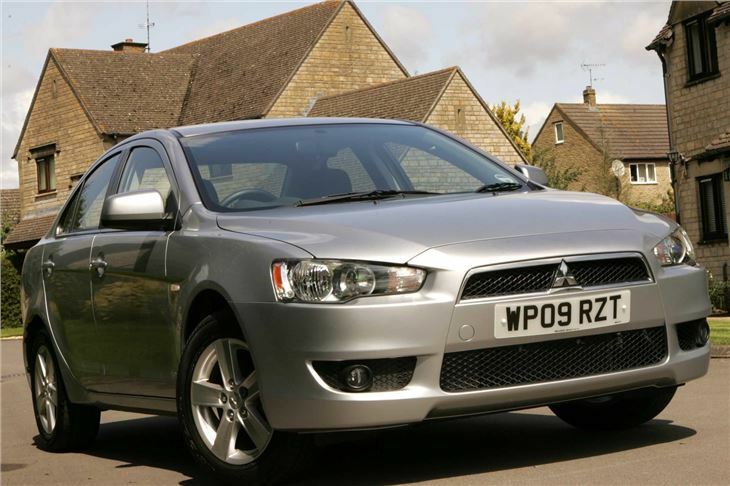 But by Summer the Lancer will have grown into such a big range of cars it will offer something for almost everyone looking for a mid-size car. From a 110PS vicarage spec 1.5 at £12,499 to a fire-breathing boy (or girl) racer’s 359PS EVO at more than three times the price.